Craig Mackail-Smith celebrates one of his 99 Posh goals. Former Peterborough United star Craig Mackail-Smith admits a return to the ABAX Stadium with Luton Town in the second round of the FA Cup will be a ‘dream come true’. Posh were paired with the mid-table League Two side in last night’s (November 9) second round draw which means the chance for home fans to salute Mackail-Smith and another club legend in goalkeeper Mark Tyler. Luton boss John Still used to manage Posh. Mackail-Smith famously finished on 99 goals for Posh when he left the club for Brighton in July 2011. The 31 year-old is the third-highest goalscorer in Posh’s Football League era behind Jim Hall and Tommy Robson. “It is a dream tie for me,” Craig Mackail-Smith told www.theposh.com. “When both teams won and progressed at the weekend, this was the draw that I was looking for. I have been back a few times and it is very special for me. “I had a wonderful time at Peterborough. I have great memories and it is a tie that I firmly believe is a bit of a stand-out just because of the sheer amount of connections between the two clubs. “I know that Mark Tyler will be really looking forward to it. It is interesting because we both loved our time so much so maybe it is 50-50 who is the real story! Luton midfielder Josh McQuoid during his Posh playing days. Mackail-Smith has scored three goal in 15 appearances for Luton this season. He cand Tyler both missed the FA Cup first round win at Crawley on Saturday (November 7). In 15 years at Posh, Tyler made 486 appearances, which is the second-highest total in the club’s Football League era. Tyler (38) has already racked up 269 games for ‘The Hatters’. 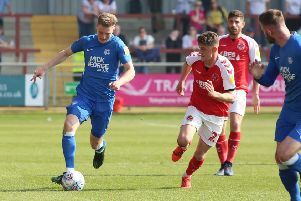 He admitted in the Peterborough Telegraph last week that he watched every cup draw hoping he would be able to make an emotional return to Posh. He hasn’t played competitively at the ABAX Stadium since he left for Luton in 2009. Luton left-back Scott Griffiths makes a tackle for Posh. There are numerous connections between the clubs as Luton are managed by John Still who had an unsuccessful 67-game spell in charge of Posh between 1994 and 1995. Midfielder Josh McQuoid scored both Luton goals in the 2-1 win at Crawley. He also scored the opening goal in Posh’s Johnstone’s Paint Trophy Final win over Chesterfield at Wembley in 2014. McQuoid was on loan from Bournemouth at the time. And left-back Scott Griffiths (29) is a regular in the Luton starting line-up. He played 21 times for Posh between 2009-2010. There will also be a couple of Posh players keen on making an impression when the tie is played on the weekend of December 5/6. Striker Lee Angol was a Luton player last season, but failed to make a single first-team appearance for the club before switching to Posh in the summer. And Erhun Oztumer was close to signing for Luton from Dulwich Hamlet before reportedly failing a medical. Both Angol and Oztumer’s careers have flourished since moving to a higher standard.